This scribble was published on Thursday, November 27th, 2008. You can follow any banter on this scribble with the RSS 2.0 feed. You can share your inspired musings after typing the anti spam word near the bottom of the page. But no Pinging because its too naughty. This is why people shouldn’t live on their own. I’m free for a ‘Marmite’ twosome! Scarlet, I always keep an ample supply of twigletts in the house, they were difficult to find in the US so I’m making up for years of abstinance. 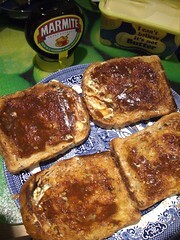 Stephen, I suspect there might be a marmite appreciation evening brewing at the Wendy House in the near future.